New Delhi: Automobile sales registered a double-digit growth in June largely on the back of a low base in the corresponding month last year with manufacturers slowing down the supply of inventory to dealers just before the implementation of the goods and services tax (GST) and the sustained growth in economic activity in that period. 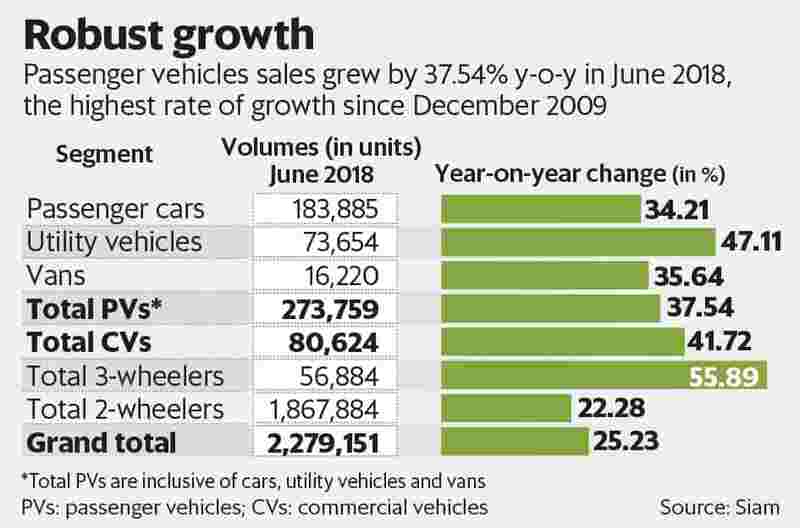 Passenger vehicles sales grew by a whopping 37.54% year-on-year to 2,73,759 units, the highest rate of growth since December 2009 when the automobile industry was recovering from the impact of the economic slowdown in 2008. This was led by a robust 47.11% year-on-year (y-o-y) increase in sales of utility vehicles 73,654 units, according to monthly sales data released by the Society of Indian Automobile Manufacturers (SIAM). Passenger car sales also improved by 34.21% y-o-y to 1,83,885 units during the same period. The low-base effect, coupled with the improvement in sectors such as manufacturing and infrastructure, also led to the increase in sales of commercial vehicles by 41.72% y-o-y to 80,624 units. Sale volumes of medium and heavy commercial vehicles (M&HCV) jumped by 43.34% y-o-y to 30,352 units. The manufacturers of these vehicles have also increased production, expecting a sustained increase in demand till 2020 when the new emission norms will be introduced. The sales of the light commercial vehicles also increased by 40.76% y-o-y to 50,272 units. “This kind of growth is hard to sustain and the base effect will also catch up in the second half of the fiscal year. However, I am sure most of the segment will grow substantially in the rest of the three quarters this year as the economic activity has been improving," said Sugato Sen, deputy director general, SIAM. The revival in the rural economy because of two consecutive years of near normal monsoon along with the low base effect also saw motorcycle sales jump by 24.32% y-o-y to 11,99,332 units while scooter sales also increased by 20.96% y-o-y to 6,01,761 units during the same period. Total two-wheeler sales during the month increased by 22.28% y-o-y to 18,67,884 units.